You can use Dell EMC Data Domain storage systems with Data Domain Boost (DD Boost) as backup repositories. DD Boost library. The DD Boost library is a component of the Dell EMC Data Domain system. 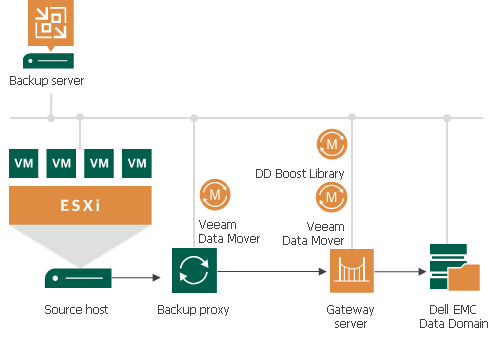 The DD Boost library is embedded into the Veeam Data Mover Service setup. When you add a Microsoft Windows server to the backup infrastructure, the DD Boost Library is automatically installed on the added server together with the Data Mover Service. DD Boost server. The DD Boost server is a target-side component. The DD Boost server runs on the OS of the Dell EMC Data Domain storage system. The Dell EMC Data Domain storage cannot host Veeam Data Mover Service. For this reason, to communicate with the Dell EMC Data Domain storage, you need to deploy a gateway server. Veeam Backup & Replication will automatically deploy a Veeam Data Mover on this gateway server. For more information, see Gateway Server. You define what gateway server to use when you assign a backup repository role to Dell EMC Data Domain. You can define the gateway server explicitly or instruct Veeam Backup & Replication to select it automatically. For Dell EMC Data Domain storage systems working over Fibre Channel, you must explicitly define the gateway server that will communicate with Dell EMC Data Domain. As a gateway server, you must use a Microsoft Windows server that is added to the backup infrastructure and has access to Dell EMC Data Domain over Fibre Channel. TCP/IP protocol: Veeam Backup & Replication communicates with the Dell EMC Data Domain server by sending commands over the network. Fibre Channel protocol: Veeam Backup & Replication communicates with the Dell EMC Data Domain Fibre Channel server by sending SCSI commands over Fibre Channel. Use of Dell EMC Data Domain with DD Boost does not guarantee improvement of job performance. It reduces the load on the network and improves the network throughput. NFS services must be enabled on Dell EMC Data Domain. Otherwise, Veeam Backup & Replication will not be able to access the storage system. Dell EMC Data Domain does not support the reverse incremental backup method. You cannot use Dell EMC Data Domain backup repositories as sources or targets for file copy jobs. When you create a backup job targeted at an Dell EMC Data Domain backup repository, Veeam Backup & Replication will offer you to switch to optimized job settings and use the 4 MB size of data block for VM data processing. It is recommended that you use optimized job settings. Large data blocks produce a smaller metadata table that requires less memory and CPU resources to process. The length of forward incremental and forever forward incremental backup chains (chains that contain one full backup and a set of subsequent incremental backups) cannot be greater than 60 restore points. To overcome this limitation, schedule full backups (active or synthetic) to split the backup chain into shorter series. For example, to perform backups at 30-minute intervals 24 hours a day, you must schedule synthetic fulls every day. In this scenario, intervals immediately after midnight may be skipped due to duration of synthetic processing. For more information, see How Synthetic Full Backup Works. If you connect to an Dell EMC Data Domain backup repository over Fibre Channel, you must explicitly define a gateway server to communicate with Dell EMC Data Domain. As a gateway server, you must use a Microsoft Windows server that is added to the backup infrastructure and has access to the Dell EMC Data Domain backup repository over Fibre Channel. During backup repository rescan, Veeam Backup & Replication detects if the hard stream limit is set for a storage unit, and displays this information in backup repository rescan statistics. If the hard stream limit is exceeded when Veeam Backup & Replication runs tasks against the backup repository, Veeam Backup & Replication will fail to create new I/O streams. For more information about working with Dell EMC Data Domain, see https://www.veeam.com/kb1956.